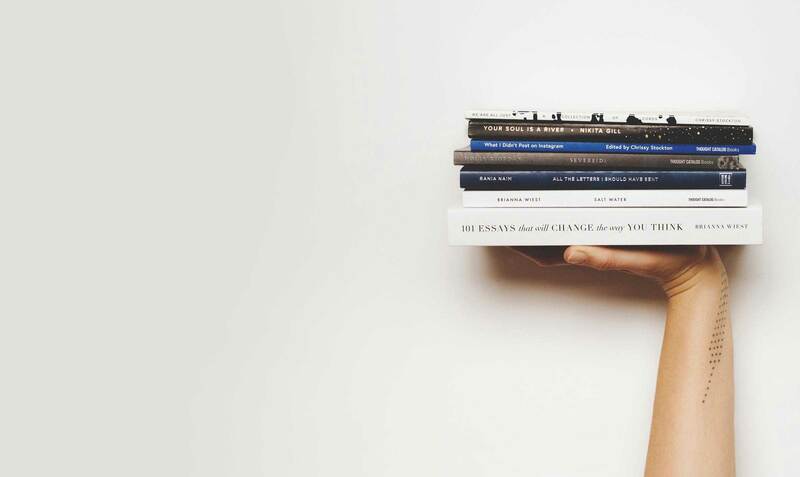 Tablo is a platform for publishing real books, to every bookshop in the world. 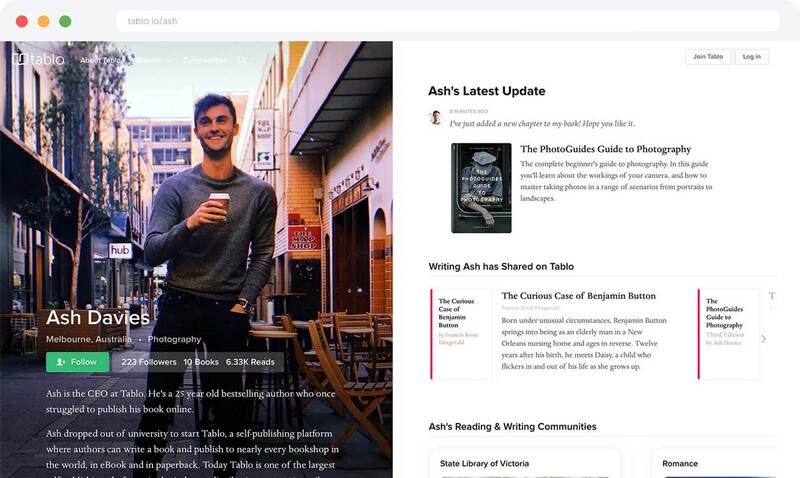 With Tablo, publishing a book is as easy as writing something and clicking publish. Your books can be available in eBook, paperback and hardcover with every bookshop in the world, including Amazon, with each copy printed and shipped on-demand. It's the simplest, and the best way to publish a book. 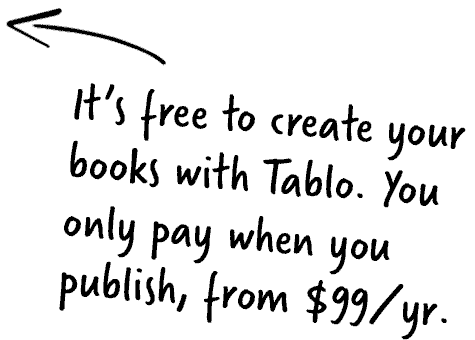 Join 80,000 authors and publish your book with Tablo today. It's so easy, you'll want to write even more. Creating a real book with Tablo is as easy as writing or uploading something, and clicking publish. If you already have a Word Document, you can upload it directly to Tablo. If you don't, you can create a new book and type it up in the browser. 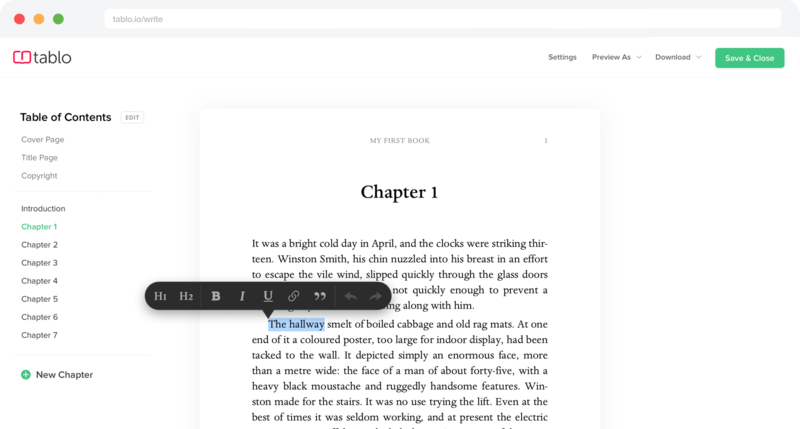 Tablo's BookMaker lets you build a table of contents, format and style your book, add images, and see exactly what your book will look like in print. When you're ready, you can publish it with a click. It's the largest distribution network available to authors. You can publish your books to 40,000 retailers and 30,000 libraries, and they'll always be in-stock. 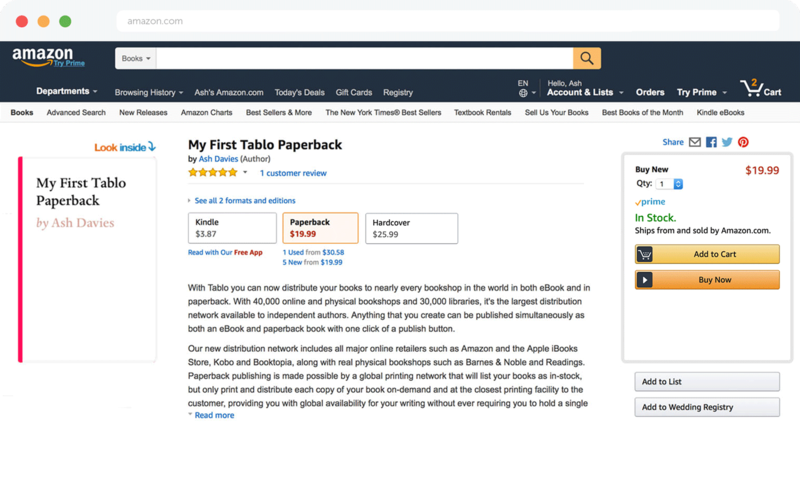 When you publish with Tablo, your books can be available in eBook, paperback & hardcover with every bookshop in the world, including Amazon, Barnes & Noble and thousands of physical stores. Anytime a reader buys your book, each copy will be printed and shipped on-demand from the closest location to the customer. Three simple plans to publish your books. Our plans include everything, from assigning ISBNs to creating your book's assets. Your book published as an eBook. Distribution to 35 online bookstores, including Amazon. Set your own price, keep all of your rights and royalties. Your book published as an eBook and Paperback. Distribution to 40,000 bookstores and 30,000 libraries, including Amazon. Your book published as an eBook, Paperback and Hardcover. Keep all of your royalties. You'll receive 100% of your sales proceeds, after retail commissions and printing costs. We automatically deduct the printing cost from your royalty, so you'll never need to invest in an upfront inventory and can enjoy a profit every time you sell a book. Keep all of your rights. We're authors at Tablo, so we care deeply about your rights. Tablo doesn't seek anything — only a non-exclusive permission to publish on your behalf. You'll always maintain the full rights to your book, so you can publish, cancel or change services at any time. Tablo books look and feel beautiful. Choose from our traditionally typeset book themes. 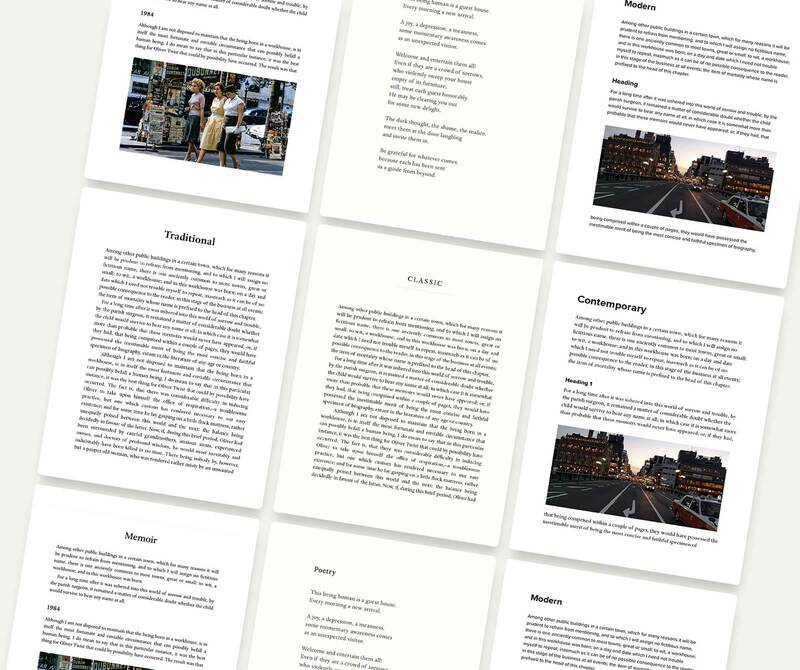 From novels and memoirs, to non-fiction journals and poetry, we've crafted a set of themes that perfectly typeset your writing across a variety of genres. There's more than just books. Every Tablo author gets an Author Profile, to help you build a home for your writing career. You can use your profile to promote your books, or share samples of future writing to seek feedback and build an audience. Any reader can follow your profile subscribe to updates. Tablo is home to thousands of writers, and dozens of reading & writing communities. They'd love to hear from you. Take your books to the world. We care deeply about creating the best possible publishing experience for authors — one that's simple, enjoyable, bares no gatekeepers, and lets you publish globally with the fairest possible terms. 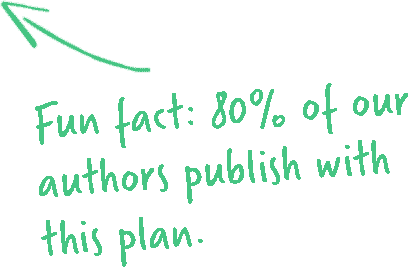 More than 80,000 authors love using Tablo to publish their books. We hope you do too.